Thank you. Only the announcement has not yet appeared in the eBay listing. Thank you. Yes it is really very beautiful resin. it is dense and opaque and velvety to the touch. looks like porcelain. 3 page allurose already posted my feelings). She was holding a doll in his hands. 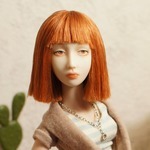 These dolls are incredible, works of art. Oh thank you allurose ))) I have already passed your words above. This is one of the most durable и красивых resin. Master long perfected the formula to achieve this result. In General resin - plastics firm smooth-on (USA). Task 3. New doll in the process, this girl is on order. Her colors are beautiful! And what a tease you are, to show all those enticing heads in the background! Your dolls are at the top of my list! I'm saving my money as fast as I can! Just beautiful- I think everyone has said it all, but may I add what GREAT legs she has!!!! Yes!!! And you wouldn't believe how she can pose them! She can wrap her hands around her feet! Wow! That's amazing- I can kind of get that pose with the Sisterfox dolls, but only if they are propped up against a wall or backrest! I would love to see that! I love posing photos! Aww, what a beautiful girl! So sweet! I really like her eyes! I will try and get some taken soon! I really need to take some time out to have a proper play with my girls, but have been so busy lately they have been sadly ignored!!!! Very frustrating as I would also like to spend lots of time creating some costumes too! New doll, this doll will be available for sale in December!